When waters of two different densities meet, the dense water will slide below the less dense water. The differing densities cause water to move relative to one-another, forming a density current. This is one of the primary mechanisms by which ocean currents are formed. It appears that this effect was first explored by Marsigli who visited Constantinople in 1679 and learned about a well-known undercurrent in a strait (the Bosphorous) that flows between the Black Sea and the Mediterranean. Fisherman had observed that “the upper current flows from the Mediterranean to the Black Sea but the deep water of the abyss moves in a direction exactly opposite to that of the upper current and so flows continuously against the surface current”. Marsigli reasoned that the effect was due to density differences. He performed a laboratory experiment: a container was initially divided by a partition. The left side contained dyed water taken from the undercurrent in the Bosphorous, while the right side contained water having the density of surface water in the Black Sea. Two holes were placed in the partition to observe the resulting flow. The flow through the lower hole was in the direction of the undercurrent in the Bosphorous, while the flow through the upper hole was in the direction of the surface flow. We repeat Marsigli’s experiment here. 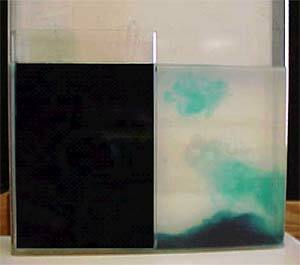 Dense water (dyed) flows rightward through a hole in a partition near the base: light (clear) fluid returns leftward through a hole toward the top. This experiment was inspired by one devised by Prof Peter Bannon at Penn State.